Just reiterating how much I enjoy your blog. Oh I love it! Great perspective and processing! But ready to spring into action if you suggest a w-a-l-k or a c-o-o-k-i-e? I want to kiss the top of his head and leave a lipstick mark. I'm with you on the Sabbath. oh, my gosh! so cute. and dogs have it so right! I appreciate the atmosphere of this photo - though, for me, it brings to mind hot summer afternoons rather than Sunday ones. 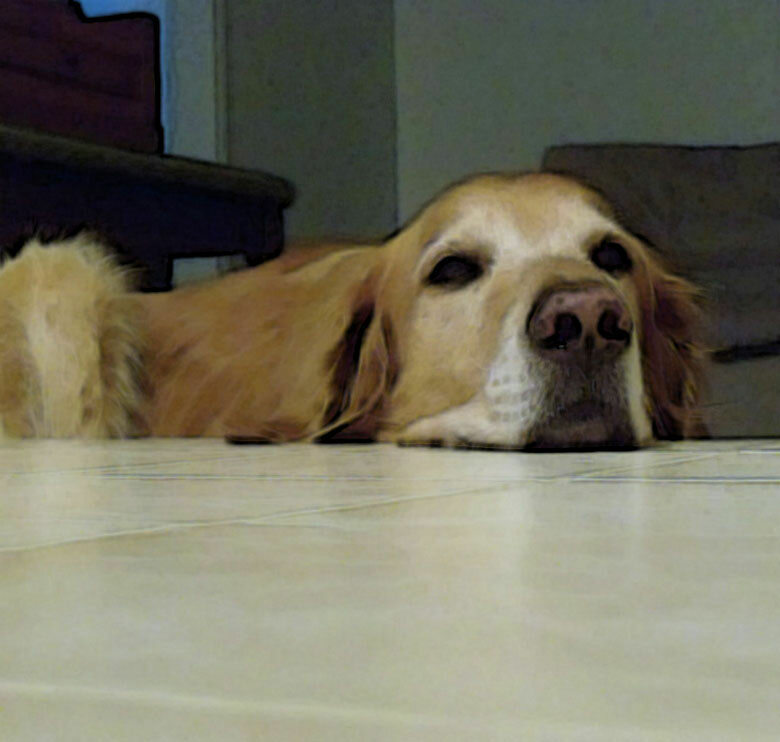 Hot outside, cool floor, waiting for something to happen, meanwhile, content that nothing is! he's a cutie for sure. and he looks completely at rest. Sam is so cute! We can learn so much from dogs. Woof, woof from Timmy and Polly! So glad I found your delightful blog again. We have that red head grey head thing going. Love the beautiful photo of the dog and the lovely blogpost. Sam obeys very well. Wise words to follow. Your words and picture sum up that old saying "it's a dog's life" perfectly. love the perspective in this shot. looks like sam is enjoying his Sabbath. hope you are as well. Sabbath, which I keep on Saturday, is my favourite day of the week. God's special blessing rests on this day and I look forward to it every week. You have captured it so beautifully here. I hadn't thought about it - but dogs do live a sabbath life don't they? I will watch and learn from my doggie friend.